Senior Jack Otto Writes Patriotic Poem "Freedom Flies"
To terrorists and tyrants she’s a frightening alarm. Where we fold her up tightly and don’t let her fall. Like watching a soldier with food sliding down on a rope. As she makes her way back to the place men are free. But that is not the only monument that has earned her fame. To the monument of men who all signed their names. So stand up and salute ‘cause this we’ll defend. I pray I see this land, this nation that I love. I’ll never be afraid to fly that Red, White and Blue. David L. Brecht, OSA died in the late afternoon of September 6, 2014. He was 75. He had been battling a leukemia-like condition called myelodysplasis since 2012. His bone marrow did not make enough healthy blood cells. The blood cells did not mature into healthy red blood cells, white blood cells, or platelets. The immature blood cells did not function normally and either died in the bone marrow or soon after they entered the blood. David underwent chemotherapy treatments. A series of blood transfusions gave him some relief, but the transfusions had become increasingly less effective. As he grew weaker, he made the decision at the end of the 2013-2014 school year to retire from teaching and campus ministry at Austin Catholic Academy, Ray, Michigan. David was born on October 17, 1938, in Detroit, Michigan, to John Lloyd and Mary Brecht. He met the Augustinians when he attended Austin Catholic High School in Detroit. He entered the Augustinian Order as a Novice on September 8, 1956 and professed his first vows on September 10, 1957. He professed his solemn vows exactly three years later in 1957. Father Brecht holds two academic degrees from Villanova University including a Bachelor of Arts in Philosophy and a Master of Arts in Classical Languages. He later earned a Diploma in Counseling from Salesian University in Rome. He attended Loyola University Chicago where he also earned a Master of Education and a Doctorate of Philosophy in Educational Administration. Amidst his studies, he was ordained to the priesthood on February 6, 1965. After ordination, Father Brecht was first assigned to Mendel Catholic High School in Chicago as a teacher and chaplain. In 1967, he was assigned to Tolentine College in Olympia Fields, Illinois, where he served as sub-master of the professed, an academic dean, and a teacher. In 1973, the same year in which Father Brecht completed his doctorate, he began teaching at Villanova University in Philadelphia and also held administrative positions there. He was later assigned to serve as Principal of St. Rita of Cascia High School in Chicago from 1979 to 1983. During this time, he also served as a member of the Provincial Council. In 1983, he was named Superintendent of Augustinian Schools and Prior of St. Nicholas of Tolentine Monastery in Olympia Fields. In 1985, Father Brecht was appointed Headmaster of Cascia Hall in Tulsa, Oklahoma. While at Cascia Hall, Fr. Brecht was responsible for the school becoming co-educational and establishing a grade 6-12 education program. In 1991, Father Brecht was elected Prior Provincial, the leader of the Midwest Augustinian Province of Our Mother of Good Counsel. As Provincial, Father Brecht launched the Augustinians' Journey of a Lifetime capital campaign to benefit the needs of the the retiring Augustinians. He served as Provincial for two terms until 1999, when he was assigned as the associate pastor of St. Jude Parish in New Lenox, Illinois. He returned to Tulsa as a teacher at Cascia Hall in 2001. In 2002, Father Brecht was again elected as Prior Provincial; he is only one of two Augustinians to serve as Prior Provincial for the Midwest Province for three terms. At the end of his term in 2006, he was named Pastor of St. Clare of Montefalco Parish in Grosse Pointe Park, Michigan. He later served as the chaplain of Villanova College in King City, Ontario, during the 2009-2010 school year. In 2010, he returned to St. Clare of Montefalco Parish as Pastor and also served as the Headmaster of Austin Catholic Academy, a new Catholic secondary school in Ray, Michigan. Named an "Outstanding Educator of America" in 1972, Father Brecht was cited for his contributions to the advancement of higher education and service to the community. He was inducted into the Four Chaplains Legion of Honor in 1980 "in recognition of service to all people regardless of race or faith." Periods of archaeological research on Roman ruins in Tunisia and Algeria, where St. Augustine lived and ministered in the fourth and fifth centuries, gave Father Brecht material for numerous lectures, published papers, and a short documentary on the life and times of Augustine. Additionally, Father Brecht has published several articles on educational themes and served on many educational commissions and task forces. Father Brecht was recognized as an honoree for the Augustinian Gala in 2014. St. Rita Offers New Digital Photography Class! Last spring, veteran fine arts teacher Robyn Kurnat approached the St. Rita Curriculum Council with an idea of a new addition to the visual arts curriculum that “provides a different medium for student’s visual expressions and creativity.” That idea came to be this fall with the addition of Digital Photography to the fine arts curriculum.Three sections of students (mostly sophomores) signed up for the new class, making it one of the most popular electives offered at St. Rita. According to Mrs. Kurnat, her goal with the class is to take an “artistic approach” that includes understanding what makes a good composition and having a good grasp on the principles of design (balance, variety, rhythm, proportion, emphasis, and unity). The class has already been around the school building shooting the visual concept of “point of view,” and according to Mrs. Kurnat the students have been doing an amazing job thus far. The students will continue to journalize their photo adventures throughout the semester-long class, all the while doing self-critiques on what went right and wrong and on what they learned on their adventure. This is just one example of the great things going on in the classrooms everyday at St. Rita. Stay tuned as we will continue to follow the most interesting classes and activities in the classrooms throughout the year. Classes begin for the 110th Year of St. Rita High School! The 2014-15 school year is underway. 2014-15 marks the 110th year of St. Rita High School. We welcome back the classes of 2015, 2016 and 2017. We also specially welcome the class of 2018! St. Rita pray for us as we begin this new academic year. Doyle Stadium's new surface is ready for the 2014 season! 5 to face Dunbar for the first game on the new surface. GO RITA GO! The final phase of work has begun on Doyle Stadium's new turf. Work on Doyle Stadium's new turf is almost complete. The crew is entering the final phase of installation. Cryogenic rubber and silica sand are being added to the turf, in preparation of the first games on Friday, September 5 against Dunbar High School. Please join us at the games on September 5th for the first look at the new surface and to support the 2014 St. Rita Mustangs! Doyle Stadium Work Nears Completion! Crews are hard at work adding the St. Rita High School logo and Augustinian crest to the new turf. Once that work is complete, silica sand and premium cryogenic rubber infill will be added. Doyle Stadium has never looked better. We look forward to seeing everyone for the upcoming season! 2014 Scholarship Golf Outing is a Success! St. Rita High School raised in excess of $49,000 for scholarships and tuition assistance on July 25 at Gleneagles Country Club in Lemont. Thanks to our 218 golfers, generous sponsors and friends of St. Rita High School for making this event a big success. Please like St. Rita High School on Facebook to see more outing pictures. Doyle Stadium's Re-surfacing Continues On Schedule! The first pice of turf has been placed on the perfectly-prepared surface of Doyle Stadium. Thanks to the efforts of skilled workers, the project continues on schedule. Soon St. Rita's red and blue will be on display for the upcoming season, as the Mustangs seek their third Illinois high school state championship. Stay tuned to the website and follow us on Facebook for continued updates on the project. Re-surfacing of Doyle Stadium has begun! Work crews are hard at work on the long-awaited re-surfacing of Doyle Stadium. Crews are taking advantage of the dry weather to remove the old surface, prepare the underlayment before laying down the new surface. If all goes according to plan, the field will be ready for opening day of fall camp where the Mustangs begin their quest for the third Illinois high school state championship. Stay tuned to the website and follow us on Facebook for periodic updates on the progress of the project. St. Rita High School has announced a new Head Coach for its varsity volleyball program. Mr. Brian Hagen ’04 joined the school for the 2013-14 school year as a full-time Guidance Counselor, and will take the reins of the volleyball program beginning next season. Hagen has been involved in coaching at the high school level for several years, coaching both club and high school teams. He coached at St. Rita in 2009 on the freshmen and varsity levels. He has also worked as an IHSA referee for several years. While a student at St. Rita, Hagen was a four-year volleyball player, and a two-year varsity standout. While playing at St. Rita, the Mustangs were regularly among the best teams in the Chicago Catholic League. His 2003 Mustangs reached the Elite 8 at the IHSA State Tournament. Hagen will look to get the Mustangs down state on a regular basis and add a 7th appearance at the IHSA tournament for the program. The teams’ most recent appearances were 2011 and 2012. "I am humbled and honored to be the new head volleyball coach at my alma mater,” Hagen stated. “I am very excited to start working with the great athletes at St. Rita and build on this programs’ long history of winning volleyball." St. Rita High School is pleased to announce the Quigley Legacy Scholarship. Starting in August, 2014, a St. Rita Freshman with a father, grandfather, or great-grandfather who graduated from Quigley South or Quigley North will receive a $1,500 scholarship (tuition discount) freshman year. Students looking to receive this scholarship must take the Entrance Exam on January 11, 2014. Please contact Mike Gallagher, Chief Financial Officer, by emailing him at [email protected] for more information about this scholarship. Camp Cost if two siblings attend is $100 ($50 per camper). Camp Cost if three siblings attend is $120 ($40 per camper). Want to Learn to Earn an Apple iPad for $75? 125 Learn to Earn an iPad campers have earned over $55,000 and taken home 125 Apple iPads the past two summers. Camp scheduled for June 16 - 20, 2014 from 1pm – 3pm each day in St. Rita High School air conditioned auditorium. Stocking Stuffer Special runs through December 18, 2013. Special Price of $75 is 100% refundable if request a refund by June 1, 2014. 1 Stock Market Investing Basics including to start investing when young and don’t put all of your eggs in one basket. 2 Value of hard work, customer service, and building long-term customer relationships to build a successful business. 3 Value of giving back as 2013 campers donated $1,968 to Misericordia. 4 Value of a firm handshake and eye contact when making a first impression. 773 925 6600 x6625 or via email at [email protected] to request a registration form or with questions or suggestions about the camp. 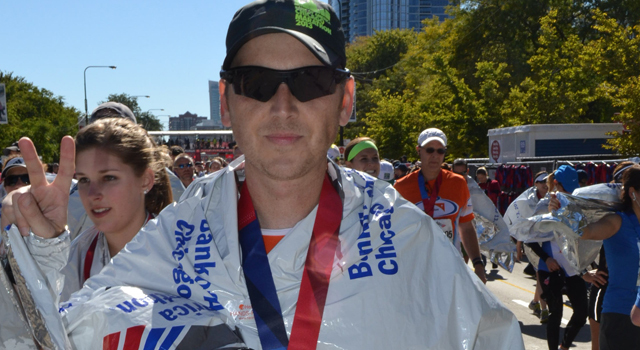 On Sunday, October 13, faculty member, Brian Gilbert, ran the Bank of America Chicago Marathon in an effort to raise funds and awareness for Team World Vision, an organization that works with children families, and communities in Africa to help them gain access to some of life’s most essential resources. While the race didn’t necessarily go as planned, he explains what kept him going and why it’s important to persevere through adversity. Why did you choose to run the marathon? The marathon has always had a mythical quality in my mind. It marked the moment when I transitioned from being a person who runs for fitness into a RUNNER! There is a quote another runner once told me, “there are only two types of people in the world: those who have run a marathon and those who haven’t.” I decided to run the marathon to test myself to see if I was physically and mentally capable of forcing myself to sustain discomfort, pain, and doubt to achieve a personal goal. The marathon became for me the ultimate test of what I could endure and what I was capable of, if I dedicated every ounce of myself to a single cause. Did you run in support of a charity? I ran to raise awareness for Team World Vision. World Vision is an organization that works with children, families, and communities in Africa to help them gain access to some of life’s most essential resources including: water, sanitation, food security and agriculture, education, health care, and economic opportunity. By working alongside families, World Vision helps to empower communities to become self-sustaining. When World Vision leaves an area, the community is able to stand on its own. Did you previously consider yourself a runner? I was not a runner in high school or college. In fact, I always hated running! I began running in 2012 after a friend asked a small group of us to run a 10K with him and his wife the morning of their wedding. I went for my first run on January 24th and was only able to complete 1.84 miles before I had to stop. I quickly began consuming every bit of information I could find about running and runners. I became obsessed with ultra-marathoner Dean Karnazes for his ability to push the body beyond its physical limits, marathoner Alberto Salazar for his commitment training, and U.S. Olympian Steve Prefontaine for his runner’s spirit. I decided I needed a physical test to push my training and ran my first half-marathon 4 months after I started running in May of 2012. In an attempt to push my limits further I registered for 2012 Chicago Marathon. I trained well beyond my physical limits throughout the summer and was forced to withdraw from the race after my doctor found a tear in my left MCL 6 days prior to the race. While I was initially very dejected, I learned a valuable lesson about finding an appropriate balance between dedication and personal well-being. Training for the marathon was an extremely physically and mentally difficult experience. I began training exclusively for the race in June 2013. Weekly training consisted of 40 – 50 miles of running, stretching, yoga, strength training, and nutritional changes. The hardest part of the training process is the personal dedication required to maintaining your training on days when you don’t feel well, have other obligations, or simply don’t feel like running. However, the personal satisfaction I would feel after completing a run, particularly on days it was hard to get out of the door, was the driving force behind the entire training process. What did the run teach you about hard work and perseverance? Running the marathon taught me we are capable of achieving anything if we are willing to sacrifice enough of ourselves to achieve the goal. Throughout my training I had focused not only on finishing but on completing the race in under 4 hours. Every run and every training session throughout the summer was dedicated to this goal. When my left hip started to tighten around mile 17 all I could think about was all of the hours I spent training to run a certain pace. But I never felt as dejected as when I ended up in the medical tent at mile 19. As I laid on the ground my thoughts were consumed with all of the hours I had spent in training. I stared at my watch and I could see my goal time slipping further and further away from me. In that moment I wanted to pull off my bib and withdraw from the race. I laid there for a few more minutes and then pulled a picture of my wife and daughter out of my pocket and thought about all of the hours I lost with them throughout my training. In that moment I realized I had to find a way to get back up and get across the finish line. The medic in the tent was able to stretch out my hip enough to get me mobile and I made my way back on to the course. I slowly ran my way the remaining 7.2 miles and crossed the finish line 1 hour and 20 minutes after my target time. But my time no longer mattered, I finished! I pushed myself through discomfort, pain, and doubt to achieve my goal. And in the end, that was the real reason I decided to run! Each year, St. Rita of Cascia High School honors the donors who support the school with generous gifts that ensure scholarships and financial aid, as well as the facilities that serve the community. At their annual reception on October 10, 2013, Ray Keane'14 spoke to the group about the opportunities he has had at St. Rita because of their generosity. Ray is the son of Raymond'79 and Donna Keane of Orland Park. A member of the wrestling and baseball teams, as well as a Kairos leader, Ray embodies what it means to be a true Ritaman. His remarks, in full, are below. Good evening Mr. Mrozek, Mr. O’Neill, Fr. Tom, the Augustinian Community of St. Rita, benefactors, board members, and friends of St. Rita. My name is Ray Keane, class of 2014. On behalf of the entire St. Rita community, I welcome you to this President’s Dinner. All of you are here tonight because of your generous donations made to the school. We would like to honor you and show our appreciation for these wonderful gifts. I personally want to thank you for all these donations. It has a great impact on my life. Let me tell you my story, but before I do, I want to thank my mother Donna Keane, and sister Renee Keane for being in attendance. I’d like to also thank my father Raymond Keane, who could not attend tonight, but is with us in spirit. In 2010, my father, Raymond Keane, who is a 1979 Rita alumni, was diagnosed with Amyotrophic Lateral Sclerosis, also know as Lou Gehrig’s Disease, or ALS. However, he had been experiencing symptoms going back to 2007. It started with the loss of strength in his right arm and quickly spread to his entire body. Over the past five years, his salary as a respected attorney has been cut in half, due to his inability to attend court. Today, he is 100% incapable to move independently and relies on the help of my family and me to assist his needs. Now why is this relevant to this dinner? In no way am I looking for a sob story. These are simply the harsh facts of my current situation. The reason I bring this up is to demonstrate how much of a family the St. Rita community has been to my family and me in our time of need. With the donations given by generous people like all of you, St Rita was able to assist my parents financially to help pay for my tuition. If this hadn’t occurred, I would have to transfer to another school. When I arrived at St. Rita I had not known if I made the right choice. I was the only kid from my grade school of 850 in Orland Park to attend Rita. In fact, I was expecting to attend Carl Sandburg high school my entire life. One day, while driving home from my grand parent’s house in the city with my dad and brother, I noticed we were near where I thought St. Rita was located. I had seen an ad in the paper for their open house, and realized it was occurring at that moment. I decided to ask my dad to stop there, just to check it out. I mean, my father went there, so I figured I could just see what the school looked like. As we entered, I noticed a sense of school spirit that I had not experienced before. Everything was covered in Rita logos, and Mustangs pictures. It was a cool site to see. After walking into the gym, I made my way to the wrestling table, as I aspired to wrestle in high school. This was when I met my coach Dan Manzella. To be honest, he is the one who got me to want to attend St. Rita, right then and there. He was a down to earth guy, who was passionate about wrestling, but even more so about the school. He made us feel important, taking us for a tour of the wrestling room and school. He was very genuine in what he said. That’s something I never experienced from a high school coach. I knew St. Rita was different, and now I was strongly considering attending. When I got home, I was excited to tell my mom the news. When I pulled out the pamphlets and said I’m considering St. Rita, she said very quickly, “No, I won’t send you to a place like that.” You see, my mother had preconceived ideas that Rita might be a misogynistic environment. She couldn’t understand how I’d be able to work in the business world with females, if I attended an all-male school. Boy did her opinion change fast. Just like me, she was nearly sold on Rita after seeing the school and realizing how caring everyone is. She said she felt a vibe here that she couldn’t describe. I think she also liked the fact I would have no excuse not to attend church. When we got home, she told me I could go where ever I wanted. In my mind I knew, Rita was the choice. So on the first day of school, I was at 77th and Western. My career at St. Rita had begun. The first day of school was very intimidating. I knew no. Yet, I was accepted for who I was as a person. I never felt alone or by myself. Even though I didn’t technically know anybody, everyone was still friendly enough to treat me with respect. To be honest, friends were made easily, because of the friendly environment that is present here. As a matter of fact, I met one of my best friends while at St. Rita, Ryan Barr. Now who would have thought one kid from Orland Park and another from Blue Island would become best friends? I honestly had never heard of Blue Island, and had no idea where it was located. Even with our differences, Ryan and I clicked the instant we started talking in our Honors Biology class. To this day we talk everyday. The reason our friendship is different is that we can talk about anything. I owe a lot to Ryan for putting up with some of my craziness. He is always there for me if I need to talk about the struggles at home, or just need to take my mind off things. Our friendship is something I will always treasure, and it would not have happened if not for St. Rita. A big change for me that I noticed was how caring and relatable the teachers and staff were. 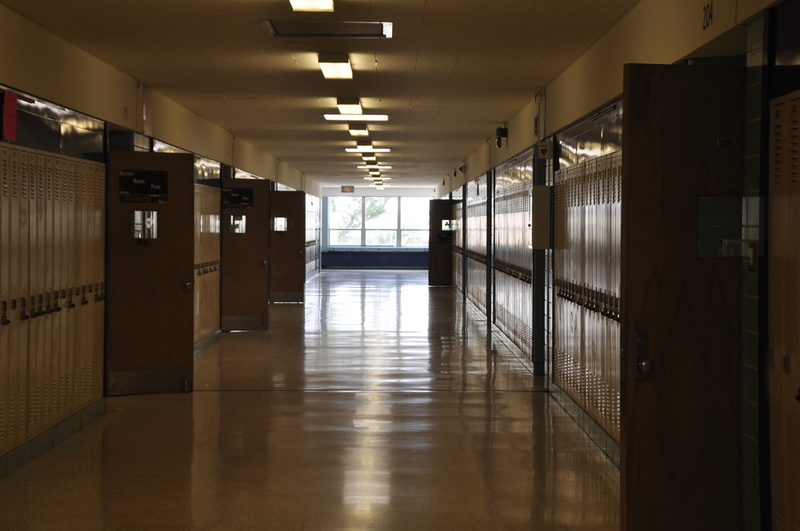 In junior high, the feeling was that teachers wanted to just teach and leave. At Rita, teachers I’ve had like Mrs. Dion and Mr. Partacz genuinely cared for my wellbeing, both in school and out. Even the little things of asking me “how are you doing Ray”, or “how’s your dad feeling”, is something I can’t really describe. The love and concern they and everyone has shown me is remarkable. That’s something I would have never expected. The entire staff here truly loves their jobs, but more importantly, truly cares for the students. You can’t get that just anywhere. Rita really is a tight knit family. I also appreciate all the help from teachers who have assisted me with my academics. I have stayed on top of my grades, receiving gold and silver honors every semester and currently ranked in the top 15 percent in my class. I owe this not only to my personal hard work, but the immense help from the St. Rita staff. Approaching teachers to ask questions is not an intimidating thing at all. They are all down to earth and would be happy to help. I can’t say enough about the staff and academics here at St. Rita. Another aspect of St. Rita that has been helpful to me is the faith community. As I have gotten older, my faith has grown stronger. I owe this to the strong faith shown at St. Rita. Over the past year, I have gotten a lot more involved in Campus Ministry. Just this year, I led Kairos 113, which is a retreat for seniors. It was an unbelievable experience as I was able to more openly share the issues that have occurred at home. The overall friendly environment helps relieve stress and allows you to be yourself during school. Daily conversations with Mr. Blazack, our Campus Minister, cracking jokes at one another or just discussing life, has helped me get my mind off some of the negative things in my life. The faith community here has just been terrific. And as I mentioned before, I know my mom loves that I am actually going to mass now. You can thank Rita for that mom. Athletically, I have wrestled and played baseball every year. The head varsity baseball coach, and Athletic Director Coach Mike Zunica, has pushed me on and off the field. The same goes for the varsity wrestling coach, Coach Dan Manzella. Both men have taught me how to be a better man. They both stayed true to what they promised me way back during that open house. Both had said that I will enter a boy and leave a man. I believe this to be true. These coaches have had an immense impact on my life, showing me how to be a better human being. I can specifically recall how Coach Manzella has taught me that family comes first. Usually, he is the type of coach that never allows practices to be missed. Yet, I remember one November day in my junior year when my mom texted me saying I needed to come home now. My grandmother had just passed away. I was hesitant to ask coach to leave, thinking he’d say no. On the other hand, he looked at me and said, “go take care of your family. That’s the important thing in life.” He taught me right then and there that life is bigger then just sports, or school work. It’s about being there for your loved ones. These lessons are something I will always treasure, and I thank both Coach Zunica and Coach Manzella for helping me buy in to their programs, and St. Rita as a whole. Now for something that isn’t 100 % known, my future. While I can’t look into a glass ball and see where I’ll be in 5 years, I can make goals that help me strive for success. After graduating St. Rita, I hope to attend a major university, looking to major in business economics. With this degree, I plan on taking the LSAT, attending Law School, and passing the BAR Exam in order to receive my law license. From here I hope to practice law, and eventually open my own firm. Now I realize these are pretty lofty dreams to have. But I can honestly say this doesn’t bother or intimidate me. Reason being I know how to succeed in this world from the morals and ideals I’ve been taught during my time at St. Rita. This is something you don’t get everywhere. How many schools have the family environment where a student can walk down the hall and the principal will know their name by heart? Or where you can find a school where over 90% of the student enrollment is involved in extracurricular activities? There is no environment like St. Rita. I know this was the right place for me. And I thank you for you donations that allowed me to stay enrolled here. In no way have I taken this opportunity for granted, as I have made the most out of every opportunity that has crossed my way. I realize I am unable to pay any of you back for those remarkable donations. So for the past four years, I have tried to pay you, not in money, but in hard work and dedication, to show that not a penny of your donation has gone to waste. Once again, I thank all of you from the bottom of my heart. Thank you and God bless. Tuesday, October 15th, at 7:00 pm in the St. Rita Auditorium. Given that college costs continue to be viewed as a national concern and given the most recent changes in the student loan program, you will not want to miss this year’s presentation by Frank Palmasani, author of “Right College, Right Price” and the creator of the financial fit program. The presentation will combine a power point presentation, examples of actual net cost scenarios, and a dynamic website to demonstrate how every family can afford college without excessive borrowing. This program is appropriate for parents of students in all grades! Please contact Wes Benak, Director of Guidance, by emailing him at [email protected] or calling 773.925.6600 if you have any questions. St. Rita Honors Award Winners from The University of Rochester’s High School Scholarship Program at All-School Grandparents Day Mass on October 13, 2013. 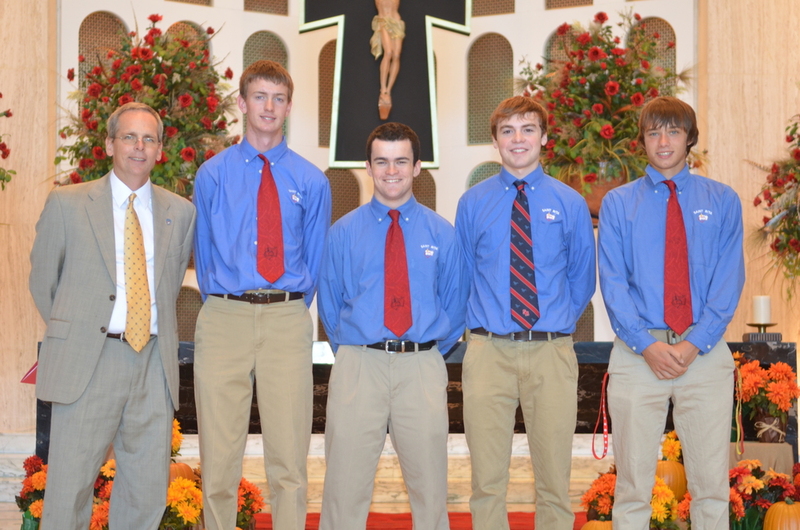 St. Rita Honors Award Winners from The University of Rochester’s High School Scholarship Program at All-School Grandparents Day Mass on October 13, 2013. Each student awarded will receive a certificate, small gift and a monetary award worth at least $7,500 per year (totaling at least $30,000 over four years) from the University of Rochester. George Eastman Young Leaders Award: Awarded for strong leadership experience at school and in the community; high grades and challenging courses; and extensive involvement in extracurricular activities. Xerox Award for Innovation and Information Technology: Awarded to a student who demonstrates a strong interest in innovation and/or information technology and a high level of achievement in this area; exposure to new technologies outside of school, such as pursuing serious work opportunities in local laboratories or industry; and help leads other students to new approaches to old problems, e.g. business plans for fundraising; innovative community service; after-school activities; and best uses of internal communications tools such as chat and blogs. The Frederick Douglass and Susan B. Anthony Award: Awarded for a demonstrated commitment to understanding and addressing difficult social issues; leadership and dedication to community action; and strong grades and rigorous courses taken in the humanities and social sciences. The 14th Annual Mustang Stampede will be held at St. Rita on October 6, 2013. Featuring over 20 bands, this competition is sponsored by the St. Rita High School Band and Band boosters and is coordinated byC indy Gradek, Director of Bands. The bands will be adjudicated by top university and Drum Corp International judges.